Make plans now to attend Mayo Clinic's third annual Individualizing Medicine Conference this fall in Rochester, Minnesota. This is the conference where you can learn about the latest in medical genomics and how it is being translated into medical practice. I always say it's where doctors learn what their patients are going to be asking them about in six months. Seriously, as pharmacogenomics, genomic testing, biomarker discovery, epigenomics or the microbiome have increasing impacts on diagnosis and treatment, there's the risk of an understanding gap between specialists and other health care professionals as to what it all means and how to get your arms around all the details. That's where this conference can help. It's somewhere you can ask any question you want -- we're all seeking answers and taking and comparing notes. Mayo's Center for Individualized Medicine hosts the event and brings in top leaders in the field every year, so you know what you're hearing is the latest on the given topic. CME credits will again be available for some disciplines. Updates will appear in weeks to come on the conference website. 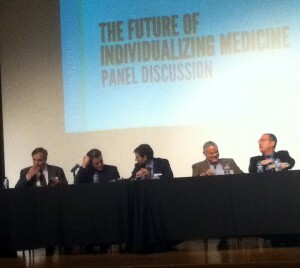 Conference website is here <http://individualizingmedicineconference.mayo.edu/> . We have a strong lineup, top to bottom, of speakers across an array of disciplines.